No new cigar is as highly anticipated as Sobremesa (at least among the more serious cigar smokers). And it goes without saying that all of the well-deserved buzz can be attributed to Steve Saka. Sobremesa marks Saka’s triumphant return to the industry after a two-year non-compete with Drew Estate—where he played a critical role in growing the company into a Nicaraguan juggernaut. Sobremesa was announced in July to almost instant excitement as the first line from Saka’s new independent cigar operation, Dunbarton Tobacco & Trust. And while Saka has always displayed humility and, at times, apprehension over how Sobremesa would be received—I’ve heard him use the phrase “unnerving”—his modesty has done little to subdue the overwhelming enthusiasm. But now, finally, after all the discussion on social media, Sobremesa is hitting retailer shelves. Chances are Sobremesa will find its way to a tobacconist near you. Retailers were clamoring to place orders with Saka at the IPCPR Trade Show this summer in New Orleans. As a result, as Saka recently told me, “We currently have 108 active accounts, and 126 on an active waiting list. We have inquires by another 19 accounts pending.” That’s a heck of a lot of interest for the debut cigar from a new cigar company, especially when you consider Saka didn’t give away any samples at the convention because he felt the cigars weren’t quite ready. Sobremesa—an idiom from the Latin world that refers to the leisurely time spent tableside after a meal—features an Ecuadorian Habano Rosado wrapper, a Mexican binder, and a filler blend of Pennsylvania Broadleaf Ligero with four different Nicaraguan tobaccos (Gk Condega C-SG Seco, Pueblo Nuevo Criollo Viso, La Joya Estelí C-98 Viso, and ASP Estelí Hybrid Ligero). It is handmade at Joya de Nicaragua. Production is currently capped at 1,000 boxes per month, despite Saka being “grossly oversold,” to maintain quality. Cervantes Fino (6.25 x 46, $11.45) is one of 6 vitolas, all of which are sold in 25-count boxes. It sports a regal word-less band of gold and mocha, along with a foot band that reads “Sobremesa.” The dark wrapper on the lonsdale is silky and oily, and the pre-light notes remind me of milk chocolate. A punch cut is all that’s needed to reveal an easy cold draw. To my taste, the profile can best be described as full-bodied, complex, and balanced with loads of rich flavor and a delicate peppery zing. I pick up hints of cocoa, dark cherry, café au lait, baking spices, and creamy caramel. The texture is thick and syrupy. The finish includes a blanket of light pepper across the palate with abundant sweetness. Construction is superb, including a straight burn, intense smoke production, and a solid white ash that hangs on tight. What stands out about the blend is how approachable it is given the full body. 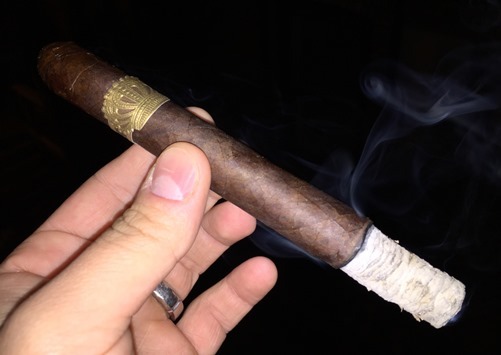 Sobremesa has tons and tons of flavor, yet it’s really easy to smoke and conservative with the spice. Consequently, the Cervantes Fino in particular is the kind of cigar that makes you want to fire up another right away. That’s one of the best compliments I can pay a cigar. Steve Saka will be the first to tell you nothing ever goes completely to plan in the world of cigars, particularly all the back-end logistics associated with setting out on your own for the first time. But you sure wouldn’t know it to smoke the Sobremesa Cervantes Fino. This is a memorable, expertly blended achievement that’s completely worthy of the price tag. For me, no rating is more appropriate than five stogies out of five. Without a doubt these are one of the most anticipated cigars for me…I just got mine ordered today and after reading your (great)review I’m very excited! I did go with the Corona Grande only because its a good size for winter! Ordered my box of Cervantes Finos today! Can’t wait. Awesome review! Thanks for the contest! I never would have found your wetisbe without it. Someone linked to it on a forum I frequent and I’m glad they did. Great site! I have it bookmarked now haha. Thanks so much for this review. As soon as I smoked one of these I thought, this is the second-best cigar I have ever smoked. The best was a Cuban. I especially like the creaminess. Will be a fan of these for quite some time.